Paul W.S. Anderson found not only his wife, but his comfort zone in the "Resident Evil" franchise. So why should his change his approach for "The Three Musketeers"? The first trailer for "The Three Musketeers" has arrived, boasting a cast that includes Logan Lerman ("Percy Jackson"), Milla Jovovich (Mrs. PWS Anderon), Matthew Macfadyen, Ray Stevenson, Luke Evans, Mads Mikkelson, Gabriella Wilde, Juno Temple, Orlando Bloom and Christoph Waltz. It's a familiar story: young D'Artagnan bullies his way into the Musketeers (Macfayden, Stevenson and Evans) to help take down Richlieu (Waltz), Buckingham (Bloom) and Milady (Jovivich). When you've got a story that's been done as often as this one on the big screen, you really need to bring something new, so Anderson has naturally made it in 3D, woven in all sorts of "Matrix"-y sequences and machine guns and flamethrowers. The end result looks a lot a "Resident Evil" film if everyone dressed in puffy shirts. Milla Jovovich Says Hubby Paul W.S. 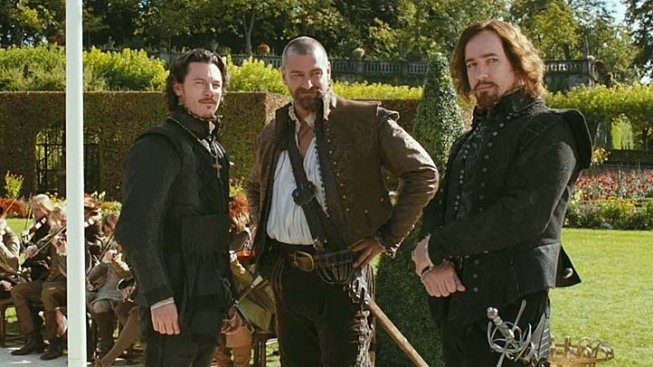 Anderson Taking 3D to "Another Level With "Three Musketeers"
Appearing in the upcoming remake of "The Three Musketeers," Milla Jovovich reveals how history will receive a new spin in 3D.